Chelsea drew a tight London Derby with Arsenal tonight, and there were plenty of ups and downs in the Blues players’ performances. 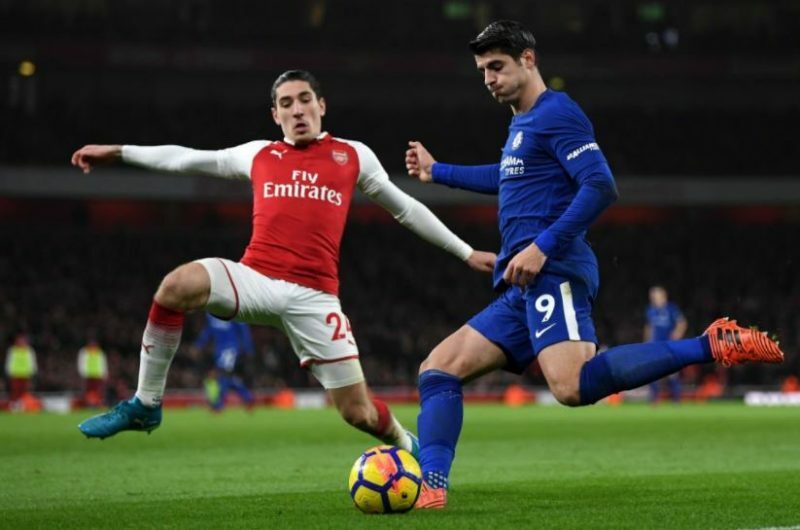 While Alvaro Morata had a nightmare in front of the goal, Eden Hazard, Thibaut Courtois and N’Golo Kante were all crucial in Chelsea’s task of not coming out of the game with empty hands. Thibaut Courtois – 8 – Made two absolute world-class saves in the first-half, denying both Sanchez and Lacazette from close-range. His form didn’t drop on the second half, but couldn’t do much about either Wilshere’s or Bellerin’s strikes. But he certainly proved why he’s regarded as one of the world’s best. Cesar Azpilicueta – 8 – Played a terrific game again, despite not keeping a clean-sheet this time. Some very important clearances, blocks and last-minute tackles. Andreas Christensen – 7 – Made a few superb interceptions and played a strong game overall. Gary Cahill – 7 – Some brilliant defending from Cahill on a threatening Arsenal corner. Almost gifted the hosts a goal on the second half though, but Courtois saved the skipper’s skin with another great save from Lacazette. Did go on to save Chelsea once more with a great clearance from a dangerous Sanchez cut-back. Victor Moses – 6 – The Nigerian was constantly booed to by the Arsenal fans, and was struggling to get past Maitland-Niles on his flank. Got replaced by Zappacosta already after 55 minutes. N’Golo Kante – 8 – One of the team’s best players again, as his tackles (especially the one on Özil) saved the Blues more than once. Still need a bit of improvement on his passing though, as he tends to lose the possession for his side here and there. Tiemoue Bakayoko – 6 – Had an OK game defensively, but the Frenchman really has to improve his attacking awarness, as he was unable to finish up each of two good chances he eventually was at the end of. Cesc Fabregas – 6 – Enjoyed plenty of room in the centre of the pitch, feeding dangerous balls over the top. Missed a great chance though, as he was brilliantly set up by Hazard on the egde of the area. His strike went just over the bar, though. Shame for him to be subbed off due to a foolish yellow card from a harsh decision by the ref. Marcos Alonso – 7 – Superb run forward and a calm tap-in rewarded him for his sixth goal of the campaign, but defensively he could have done better as he was pretty much spun by Bellerin on his side of the field. His poor clearance also gifted the Spanish Arsenal full-back the chance to score late on. Eden Hazard – 8 – MOTM – Had a good effort to put Chelsea into the lead on the second half, but Cech did very well to deny him. Was also stolen a few assists with the chances he created, but levelled up the game with his penalty. Should Conte stop subbing him off though, as he was once again brought to the bench almost 15 minutes before full-time whistle? He’s the talisman of our team, in the end. Alvaro Morata – 3 – He missed two great one-on-one chances against Stoke last time out, and didn’t seem to have learned his lesson at all here. He missed three clear-cut one-on-ones, directing two of them completely off target. Scapegoat for our draw really, and he now needs to step up his game BIG TIME to prove his worth to the club. Davide Zappacosta – 7 – Brilliant introduction to the side, as he went on to assist Alonso’s strike and hitting the wood-work just after Arsenal’s equalizer. Slightly less power on the strike and he would have been the hero of the night. Did well defensively too. Danny Drinkwater – 6 – Fairly good introduction from the Englishman, who perhaps could have done a lot more for the team had he started. Willian – 6 – Wasn’t involved as much as he could have been, but did play a very vital ball for Zappacosta which led to the Italian assisting Alonso for the Blues’ second. Good cameo from the Italian.